Human rights activist, Harvard Kennedy School Fellow and author Ayaan Hirsi Ali is on Al Qaeda's hitlist for producing a film in 2004 about life for women under Shariah Law. The director of that film, called Submission, was shot in the street and his Jihadist killers pinned a note to his chest with a knife naming Hirsi Ali as "next." Regardless of the fatwa put on her head by Islamists, Hirsi Ali still boldly speaks out and recently made an appearance on The Kelly File to discuss the horrific murders of Charlie Hebdo editors last week. "It could have been me, it could have been you, it could have been all of us," Hirsi Ali said. "I understand it and they [Islamists] make it very clear what motivates them. We know that this is an ideology, a political ideology, that is embedded unfortunately in the religion of Islam, a religion that is practiced by multitudes of people who are not violent themselves. We know this. What we fail to do over and over again is to make this connection and we are fighting an asymmetric war where we fight with military means and counter terrorism means but we are not fighting back with ideas...there is a vacuum of morality. If western society doesn't instill, again I'm using the world inculcate the values that have made the west so peaceful and prosperous through schools, through the media, through academia, through every possible peaceful channel of educating minds. What happens is you have a vacuum and vacuums like this one are usually filled by evil terrorist ideologists. What we are seeing is an Islamist, evil terrorist ideology." 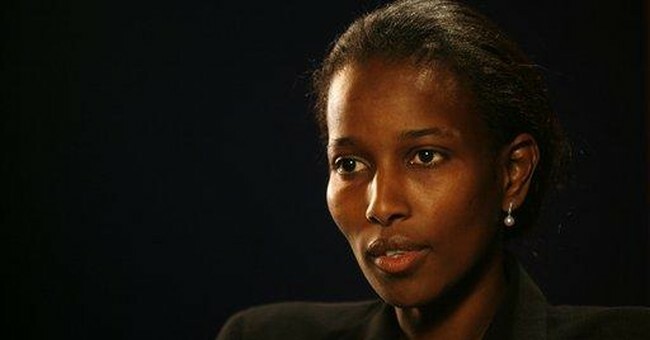 Hirsi Ali also offered a message of hope during the interview, saying that radical jihad can be defeated on the "battlefield of ideas" and with the love of life. "I love life more than I love death, they love death, that message is so much stronger than anything they put out there," Hirsi Ali said. "The only chance we have of fighting these barbarians is by talking about it...I still believe the pen is far more powerful, far more powerful, than all of their guns." Hirsi Ali also wrote an op-ed in the Wall Street Journal about the Charlie Hebdo attack that's well-worth reading.